So I have spent the last few days at my mother's house, helping her over a bad attack of gout, and as a result I broke my TBR vow of no new library books or purchases in order to read Beating Gout: a Sufferer's Guide to Living Pain Free, which was not as helpful as one might like (how big a serving of sprats is one being warned against? does anyone actually eat sprats anyway?). And I picked up a free book while I was getting the gout book from the library, which resulted in some intellectual gymnastics--"shelves of free books are really pretty much shelves of tbr books that just haven't been moved into one's own home????" or possibly "if I read this one while at my mother's and lend it to a friend down here it doesn't count for reasons." It's sloppy thinking like this that got me into the tbr hole I'm in today....But I had to take this one (Summer of the Zeppelin) because it seemed a very Charlotte-ish book--English girl in WW I finds abandoned house and wants to live in it (it was pretty good). Apart from that little slip, things are going reasonably well-- 16 books from the TBR pile have been read in 2015. One of these was The Museum House Ghosts, by Judith Spearing (1969), and if you are in the mood for the sort of high jinx that occur when a family of ghosts decide to try to pass as living people you might do worse. 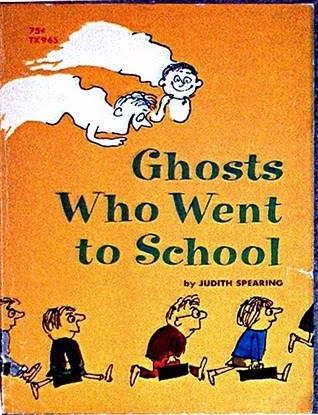 It is the sequel to Ghosts Who Went to School (shown at right; I couldn't find a picture of Museum House Ghosts on-line) in which two ghost boys decide to make friends among the living. I brought this one home from my own library's discard pile several years ago because I liked the premise--the ghost family (parents and the two boys) are going to be the caretakers of their own home that's being turned into a history museum. I myself could have used rather more "how do you make a house into a museum" and less "ghosts go shopping" and "ghosts play ball", but the family were pleasantly amusing, and the little episodes of interaction with the living were just fine. And I appreciated the humorous challenges faced by the ghosts with regard to modernity. Interestingly, it's the only book I know of in which ghosts eat for good purpose--it takes energy for them to become substantial enough to look alive, and food is required......And it was nice that so many members of the community were open to having neighbors who were otherly living. But still, more museum, less Fun, and I would have liked it more. Progress summary: This one was one I chose from the TBR challenge at Roof Beam Reader, so 11 more to go for that. 84 to go for the TBR Double Dog Dare at James Read Books.